Be still, my beating heart. 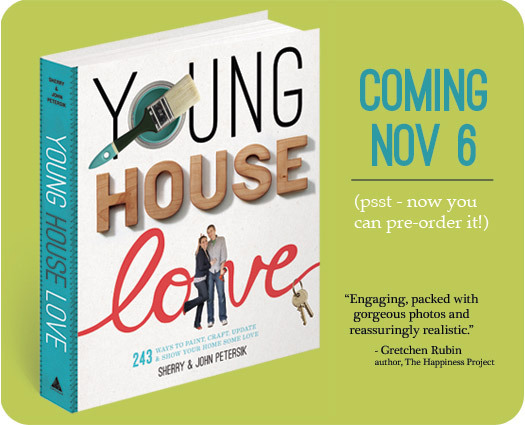 Young House Love (YHL) is coming to Dallas and I couldn’t be more stoked about it!!!!! If you’ve never heard of them, they’re totally famous DIY bloggers who get 5 million hits a month! They are a quirky couple, living in Richmond, with their daughter, Clara, and dog, Burger. Sherry and John are amazing writers and have tons of inspiring posts that get even a non-DIYer, like me, to want to do stuff mahself. I was introduced to them when I was working at the Art Institute of Dallas. A co-worker told me about this cool blog, where a charming couple DIYs on the cheap and easy, and were pregnant with their first baby. I didn’t really catch on at first, nor was very big into the blogging world (ha! ), but soon they became part of my daily ritual (even Josh knows about them). After logging in at work, I would open my email, Facebook, and YHL in that order. Probably not the best employee behavior but I did get my work done, promise. They have inspired me to make a compost bin for cheap, become addicted to ORB (oil-rubbed bronze) spray paint, and taught me a few crunchy tips along the way. 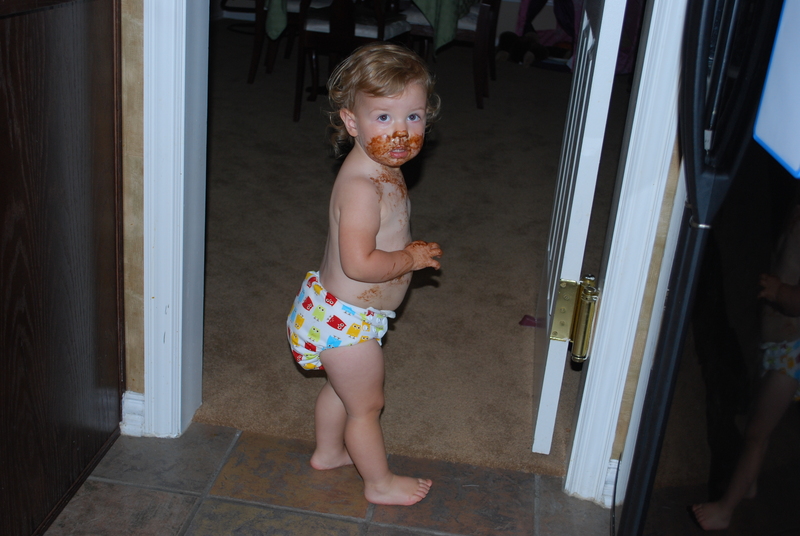 I may have a few too many products that I learned about from Sherry, but if it hadn’t been for her making cloth diapering (CDing) look so easy, I might not be where I am today. Thanks $herdog! It didn’t help that our daughters are 2 months apart and Emma is obsessed with watching Clara videos. It MIGHT be Clara’s fault that Emma is addicted to ‘Moves Like Jagger’ and ‘The Alphabet Train.’ Just sayin’! The point of the gush is this: they are coming out with a book! It’s a 243 page guide on DIYing with a boatload of inspirations and amazing projects concocted by this super sweet couple. I have never been so excited for someone’s book to come out like I am with them. I just know they will inspire me to decorate my barren house and give me tips on how to do stuff on the cheap (or at least empower me to ‘save my pennies’). Before they released the tour dates, I just knew they had to come to Texas at some point-this state is just too darn big to pass up. Lo and behold, they are coming to Dallas, Houston, AND Austin! I have family in the last two, so I asked Sherry if it would be creepy if I saw them at each stop and she sweetly said ‘no.’ It sounds good now, but when they see me show up for the 3rd and final time in Austin, they may duck and hide when I come at them with yet another book to sign. Honestly, my hope is that Emma can meet Clara. I told baby girl this morning that she could possibly meet Clara, if she comes along with John and Sherry, when they do their stop here in Dallas. I then asked if it would be exciting to meet Clara and she said ‘see Burger, too.’ Not sure if he will make an appearance but we shall see. The funniest part is when I asked Emma what she would say to Clara and she said ‘Quién es tu papi?’ (Who’s your daddy?). HAHAHA! She is going through a phase of watching her Brainy Baby Spanish video and ahem repeating every.single.thing we say around her. I nearly died laughing this morning as that was the start to my day…here’s hoping we do get to meet Miss Clara! CINCINNATI: Saturday, October 20, 10:00 A – Books by the Banks Festival, Duke Energy Convention Center. Talk, meet & greet, and signing. More details here. NEW YORK CITY: Thursday, November 1, 6:30 PM – FLOR, 142 Wooster Street; Book Party, Signing & Raffle (we’re unveiling and raffling an exclusive FLOR rug of our own design!) with wine, popcorn, cookies, and soda. More details here. WILTON, CT: Friday, November 2, 9:30 AM – Wilton Library, 137 Old Ridgefield Road. Talk & Signing. For details, call the event partner, Elm Street Books, at 203-762-3950. BOSTON: Wednesday, November 7, 6:00 PM -West Elm, 160 Brookline Avenue. Cookies, Cocoa + Crafting Ideas: A festive talk with signing and refreshments to follow. RSVP here. RICHMOND, VA: Thursday, November 8, 7:00 PM – R*Home for the Holidays at The Visual Arts Center of Richmond, 1812 West Main Street. Talk, Signing & Silent Auction: we’re offering up some of our favorite finished projects from the book to support the The School of Richmond Ballet. Wine & Hors d’hoeuvres will be served. Tickets here. Update: we’re working on a second Richmond event as well, details to come. CHICAGO: Saturday, November 10, 1:00 PM – West Elm, 1000 W North Avenue. Cookies, Cocoa + Crafting Ideas: A festive talk with signing and refreshments to follow. RSVP here. TORONTO: Monday, November 12, 6:00 PM – West Elm, 109 Atlantic Avenue. Cookies, Cocoa + Crafting Ideas: A festive talk with signing and refreshments to follow. RSVP here. MINNEAPOLIS: Wednesday, November 14, 6:00 PM – West Elm, 3879 Gallagher Drive, Edina, MN. Cookies, Cocoa + Crafting Ideas: A festive talk with signing and refreshments to follow. RSVP here. HOUSTON: Thursday, November 15, 6:00 PM – West Elm, 3910 Westheimer Road. Cookies, Cocoa + Crafting Ideas: A festive talk with signing and refreshments to follow. RSVP here. DALLAS: Saturday, November 17, 11:00 AM – West Elm, 5307 East Mockingbird Lane. Cookies, Cocoa + Crafting Ideas: A festive talk with signing and refreshments to follow. RSVP here. WASHINGTON, DC: Wednesday, November 28, 6:30 PM – FLOR, 1037 33rd Street NW. Book Party, Signing (we’re raffling an exclusive FLOR rug of our own design!) with wine, popcorn, cookies and soda. RSVP here. AUSTIN: Tuesday, January 8, 7:00 PM – BookPeople,603 North Lamar Boulevard. Talk & Book Signing. To reserve your copy and RSVP, call 512-472-5050. MIAMI: Wednesday, January 9, Time TBD – Books & Books, 265 Aragon Avenue, Coral Gables. Talk & Book Signing. To reserve your copy and RSVP, call 305-442-4408. FORT LAUDERDALE: Thursday, January 10, Time TBD – Books & Books at the Museum of Art Fort Lauderdale, 1 East Las Olas Boulevard. Lunchtime Talk & Book Signing. To RSVP call (954) 262-0255. GRAND CAYMAN ISLANDS: Friday, January 11, Time TBD – Books & Books Grand Cayman, The Town Centre at Camana Bay, Grand Cayman. Talk & Book Signing. More info here. TACOMA, WA: Friday, January 25, 1:00 PM – Tacoma Home & Garden Show. Talk & Book Signing. More info here. PORTLAND: January date TBD, 6:00 PM – Rejuvenation, 1100 Southeast Grand Avenue. Talk & Book Signing. For more info call (503) 238-1900. RIDGEWOOD, NJ: Friday, November 2, 7pm – Bookends, 211 Ridgewood Ave, book signing. More info here. 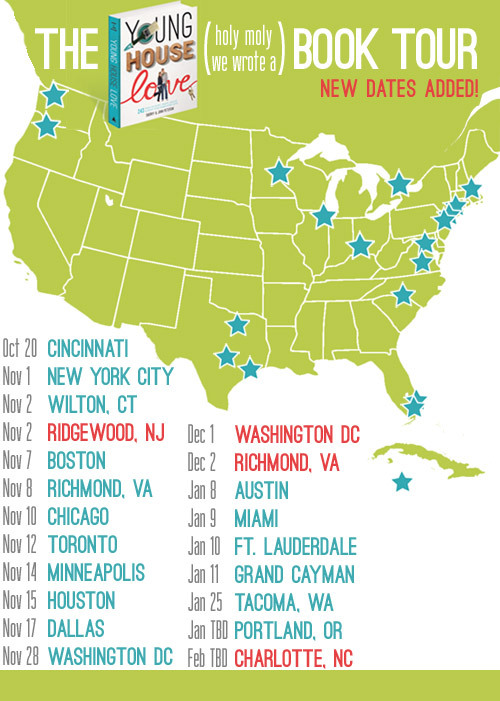 WASHINGTON, DC: Saturday, December 1st, Time TBD – Living Social, 918 F Street, Talk, holiday crafting, and book signing. More details to be released here. RICHMOND, VA: Sunday, December 2nd, 1pm – Mongrel, 2924 W. Cary Street, book signing. Store information here. There are several that you have to RSVP to, since they are way famous, so get registered ASAP! I will definitely follow-up with a post on when I do meet them, and if they ran from me or rolled their eyes seeing that’ Texas girl with the 2-year-old spitting out Spanish sayings’ coming at them. Ha.